The kids went off to camp today. I almost missed it because I had it in my calendar that camp started TOMORROW. Fortunately our camp is very unorganized, so they just sent the email on Sunday indicating the camp bus location and pick-up time for Tuesday. For those of us who are now pros at this, we know not to bother calling camp about the pick-up info, because they’ll have no idea where or what time your child will be picked up on the bus until just a few days before. When I got the email that said Tuesday, I did a double take. I thought they made a mistake. Tuesday? They’re going to camp on Wednesday! So I looked it up on the camp website and then had to reschedule Zack’s Tuesday playdate and tell the kids that their last day off before camp was cancelled. The other good thing about being an old pro at getting prepared for camp is that it no longer takes me two weeks to pack the kids. This is good because our bedroom floor tends to become camp central – Mark hates that. I did all the packing on Friday afternoon and Saturday morning. I asked the kids to gather what they wanted to bring to camp, to save me the effort of digging through their drawers and choosing all the wrong things. As part of the very small stash of clothes, Zack gave me two pairs of rolled up socks. I opened them to make sure they were labeled. Not only weren’t they labeled, they hadn’t been washed. So he wants to bring two pairs of unwashed socks to camp for 3.5 weeks. My daughter now realizes the importance of showering daily and washing her hair. Finally! So I packed her a 15 ounce bottle of shampoo, which I fear will run out in a week, because the girl uses so much shampoo that the sewer system is going to bubble over. 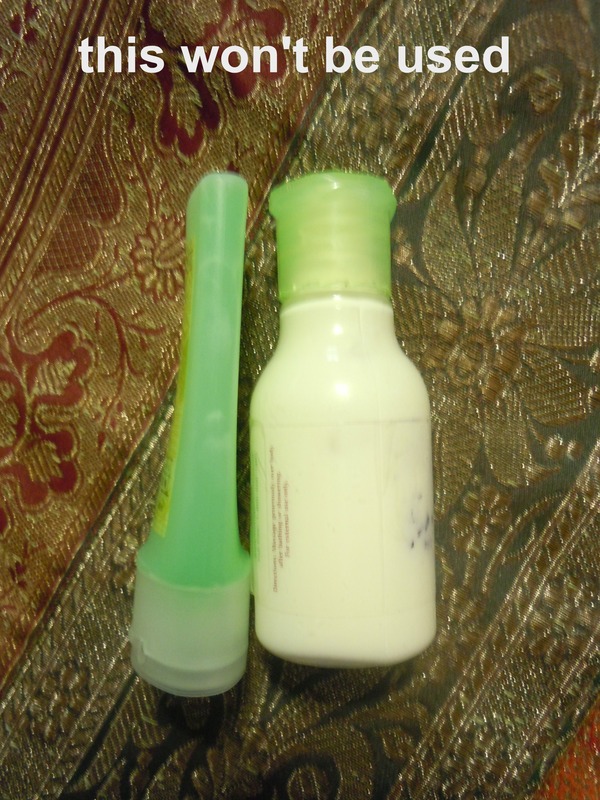 For Zack, however, I thought we’d be safe with two travel size bottles that won’t be opened. 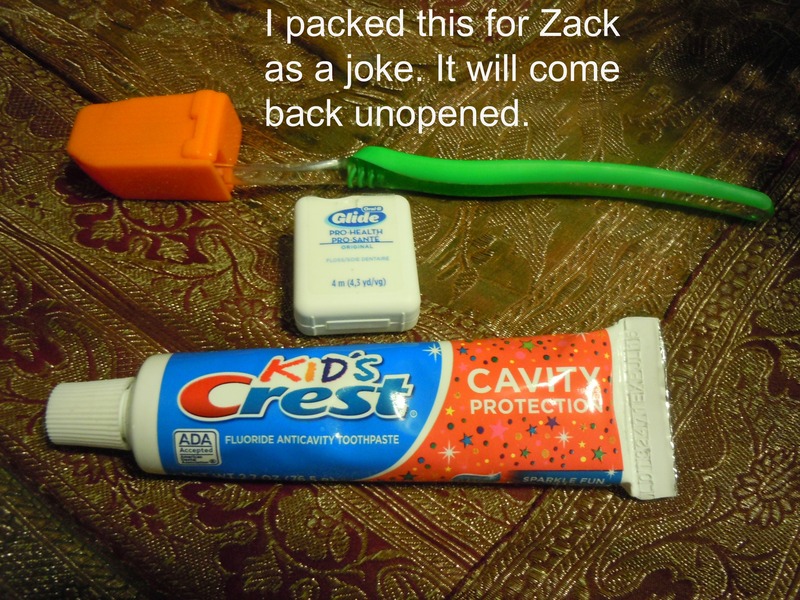 As a joke, I also packed a full tube of toothpaste for Zack, and dental floss that I think will come back still sealed. If it comes back at all. While going through the towels, which all look somewhat like this style and variation, I found one of Ben Krauss’ towels. Who is Ben Krauss? No clue! 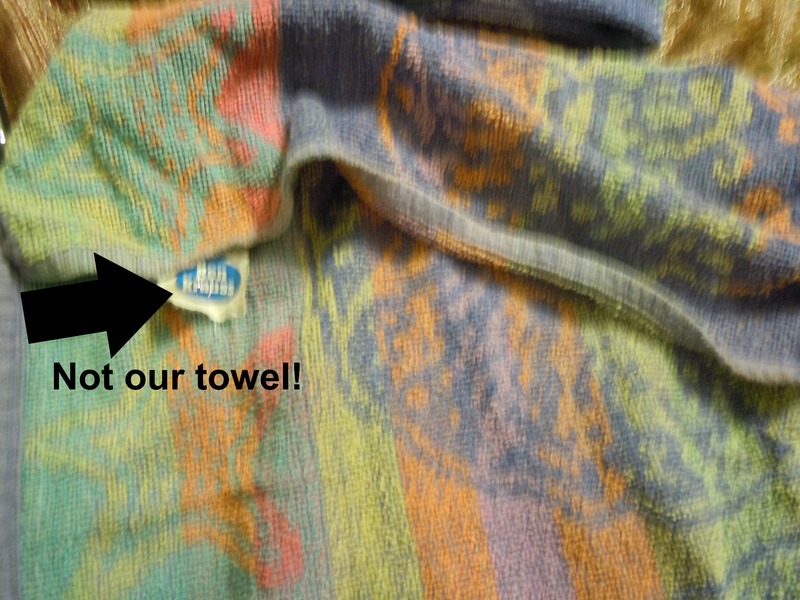 But we have his towel. Er, our towel now. I ripped off his label and put on our own. I hope they’re not in the same cabin this year. The downside to packing the day before is realizing that you haven’t even made sure that the mandatory camp t-shirts you bought three years ago still fit. That’s less of an issue for Zack, who has grown taller but is about 1.5 inches wide when standing sidways. However my daughter Dori grew 4 inches taller this year, and we’ve had to make several visits to the intimates department too. Oh well. It’s too late now. I packed the shirts and figured that Dori may be one of the most popular girls on camp t-shirt days. 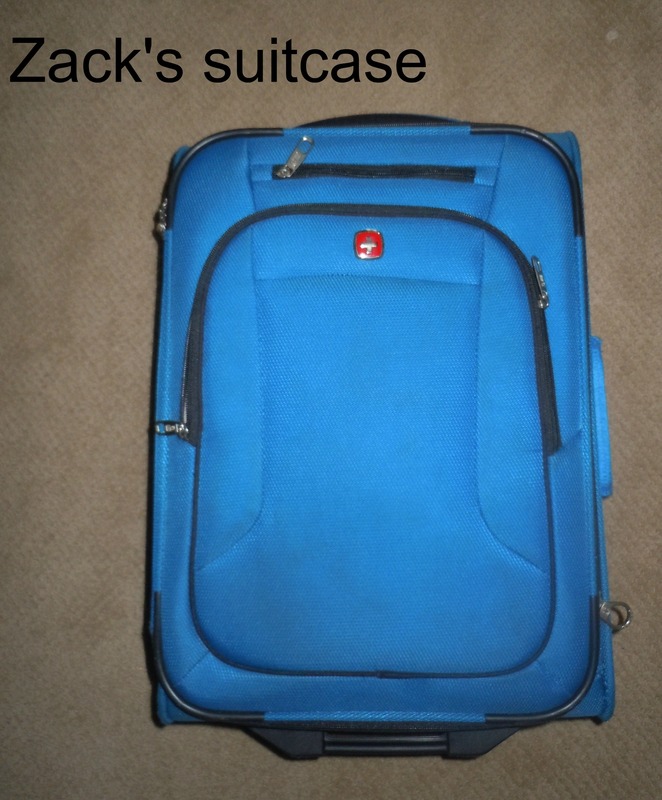 Given that last year Zack told wrote to me: “have you ever heard of laundry? You way overpacked,” and given that he provided me with 2 pairs of socks, 3 shirts, 2 pairs of shorts and 15 books for 3.5 weeks, I figured we were safe going with the carry-on suitcase this year. Dori, however, gave me 15 t-shirts, all her shorts, all her pants, all her underwear, all her socks, a blanket, comforter and sleeping bag, 2 pillows and 5 stuffed animals. It barely fit. We put the luggage out on the front doorstep on luggage pick-up day, and went to the pool for awhile. When we returned, I noticed the luggage was gone, but I had several phone messages from the luggage pick-up service. Then they called back and threatened that if I didn’t return their call right away, they would not be able to deliver my luggage to camp. Yet, there was no luggage. Had gangsters driving through the neighborhood made off with our cot-sized sheets, crappy Christmas Tree store towels, kids’ toothpaste, 2 pairs of dirty socks, tight t-shirts and ripped underwear? Fortunately the third call said “Please disregard the previous messages. We have your luggage. We had the wrong phone number for the other party.” Phew. I have a lot of faith that the luggage will make it there – on time – this year. 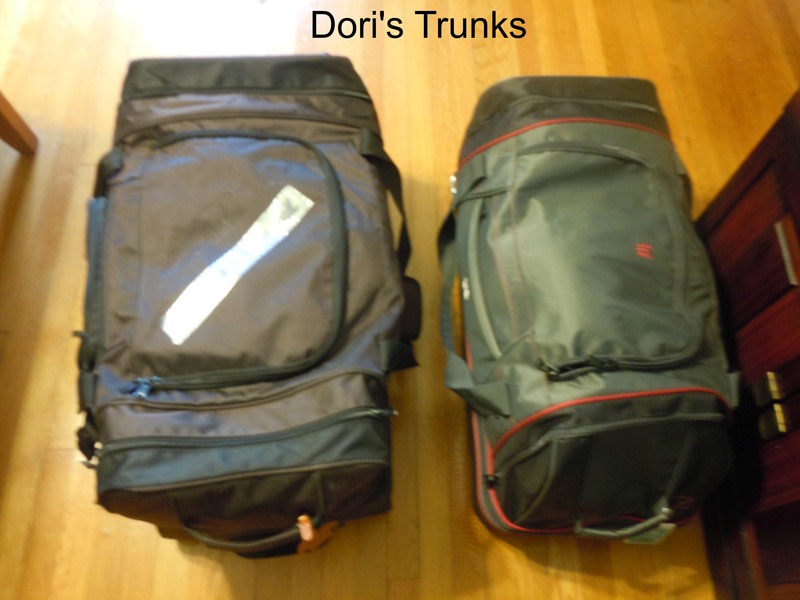 Every year, I eagerly await “the packing saga” blog post, and you never disappoint. 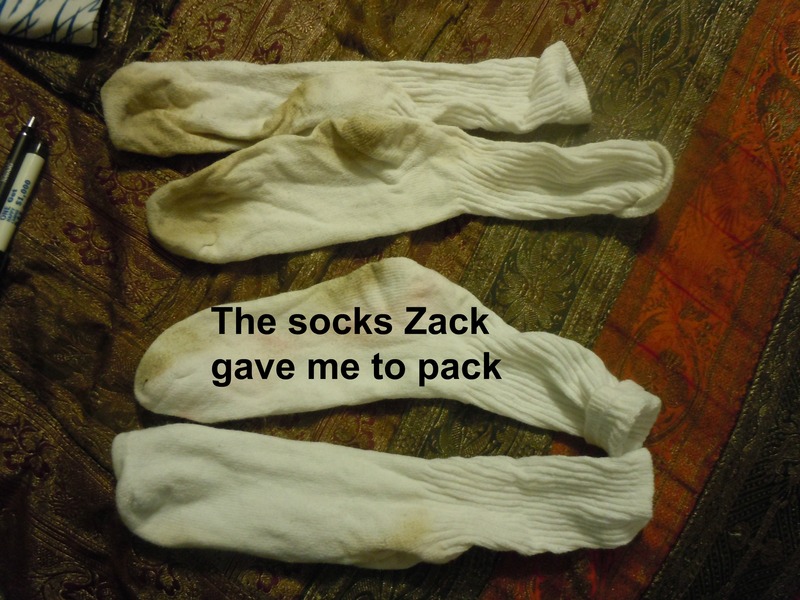 As for Zack, why bother to pack socks at all? But who is “Mrs. Kaplan”?